When my husband told me he wanted to take me out to a Rubbish Dinner that literally uses food that would be garbage, I thought he was kidding. After all, I've been on a waste-not kick as of late and I've been a little militant. 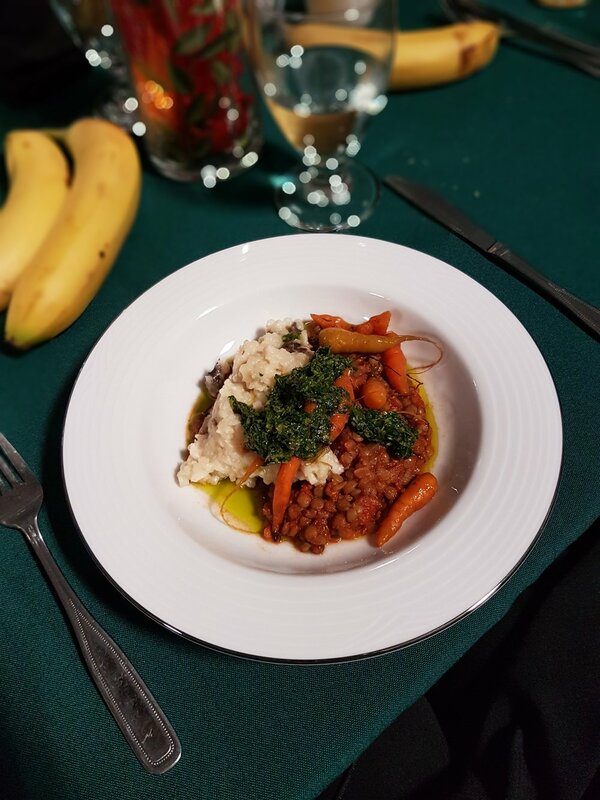 But when I googled last year's event, hosted by the Saskatchewan Waste Reduction Council, not only did I see he was serious but I was absolutely intrigued because the few photos I could find of the meals looked divine. The whole night was right up my alley: ingredients that would otherwise be wasted or go unused get featured in a concept dinner and then a documentary about the wastefulness of the food industry would be showcased. And when I saw that the brilliant Chef Christie Peters of The Hollows and Primal Pasta was on board, I couldn't say yes fast enough. When we arrived at the Legion Hall on Spadina, we were given a couple of beer tokens in the form of used bottle caps, each good for a glass of 9 Mile brewed specifically for the event using carmine jewel cherry pits and the stalks of mint, the latter of which was given to the project by The Odd Couple. I'm like eight months pregnant so although I couldn't try it, the nose of the beer was fruity yet deep. I wanted it. Obviously. We also got 'vegetarian' tent cards to put at our place setting so our server would bring us the veggie option; also available were 'vegan' and 'gluten-free' designations. We sat with a few other PotashCorp guests (thank-you to PotashCorp, my husband's employer, for sponsoring so many worthwhile community events!) but I was also happy to see Curtis Olson and Carrie Catherine of Shift Development who'd help to sponsor the night, the fabulous Laurie O'Connor of the Saskatoon Food Bank, and my fellow musician and now City Councillor Mairin Loewen. 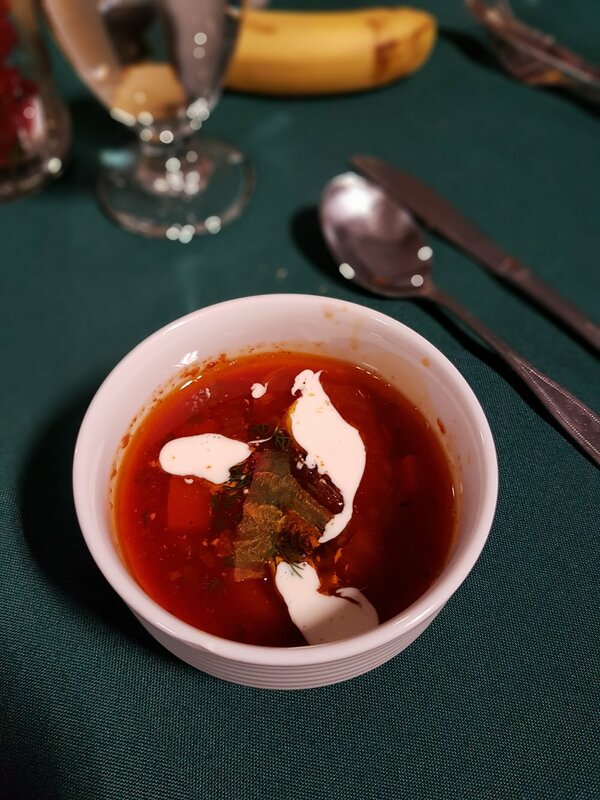 After learning a little about the evening from our Waste Reduction Council host, our first course was served: a bowl of borscht made with 'ugly' carrots, kale and dill stems, wilted cabbage leaves, and day-old dairy creme fraishe. It was un-BELIEVABLE. A little spicy and full of autumn flavours, Christie and her team knocked it out of the park and I would have never known any of its ingredients were less than perfect. The main course for non-vegetarians featured braised beef tongue but our vegetarian dish was lentil-based and honestly deserves to appear on The Hollows main menu. A risotto made with mushroom stems and parmesan rind provided just the right texture against the misshapen carrots, and the bruised basil and frost-bitten parsley pesto played a delicious top note. If this doesn't inspire you to use the last bits of veggies in your fridge, I don't know what would. We finished up with a semifreddo served over a rescued egg white meringue whose fruit sauce was made from bruised backyard fruits not beautiful enough to use whole but certainly pretty in this incarnation. It's important to note that The Hollows and Primal Pasta divert 90% of their organic waste by working with people in the community who use it as animal feed as well as by using the composting program. Their regular menu also stars under-utilized ingredients such as dandelions, sap, and roots that have been wild-harvested, plus many of the greens are house-grown. Not a wonder the Hollows' kitchen proudly sports an award from the Saskatchewan Waste Reduction Council for their efforts. Their mindfulness is always about sustainability and superior taste, making it one of my all-time top five restaurants... which is really saying something because there are a lot of goodies here and abroad! The evening ended with the Anthony Bordain-hosted documentary "Wasted" which highlighted the need for change in attitudes about food. Right now in Saskatoon, a *third* of our landfill is occupied by divertible organic waste, which is completely unacceptable. Educating people about using more of their food, composting alongside the City or on a personal level, and bringing awareness about the way the industry operates is key in making changes at a grassroots level, and the Rubbish Dinner illustrated the point beautifully. Now, the message needs to reach more ears. Have you changed your grocery buying habits to be less wasteful? How do you make the most of what you've got? And what is your next step? I encourage you to share your answer alongside this post and get your friends thinking about it, too.